The changing economic climate across the last decade proved challenging for small private colleges in the United States. Facing increased scrutiny by students over affordability, many private colleges have altered tuition models. Some experimented with tuition freezes or reductions, and others continued to raise tuition prices while also increasing financial aid spending. 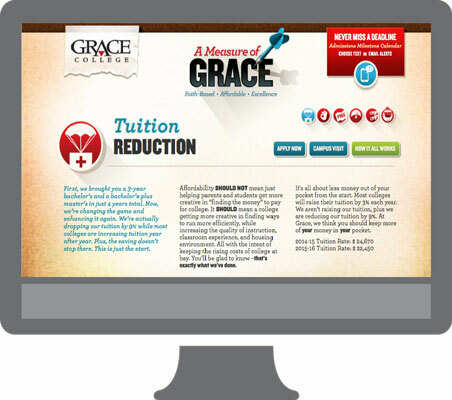 Grace College and Theological Seminary (Grace College) in Winona Lake, Indiana approached the challenge with the goal of providing students more flexible and affordable degree options. In an effort to shape the future of their institution, administrators at Grace College proposed the “Reimagination” process: an institutional evaluation focused on the areas of academic innovation, accelerated degree offerings, affordability, applied learning, and adherence to Grace College’s mission. With respect to the key area of affordability, Grace College sought to investigate how to best adjust its tuition structure to maximize student enrollments. To address this research question, Hanover employed a multi-step approach spanning several projects. Data analysis of six years of tuition and enrollment data from IPEDS for Grace College and 97 identified peer institutions. Grace College continues to surpass its enrollment goals. Grace’s administrators attribute this success largely to the elements of its Measure of Grace campaign. Measure of Grace prioritizes affordability standards including free textbook rentals, annual reductions in tuition with each continuous year of enrollment, and a reduction in overall tuition pricing. We let the research guide us towards making an informed decision regarding our pricing. Based on the results of the prospective student survey, we elected to decrease our tuition, but not as substantially as initially considered. Starting in fall of 2015, tuition at Grace College will be reduced by 9 percent – a hybrid tuition model developed using a combination of our original ideas and research from Hanover. In our process to create this plan, which we presented to the senior leadership team and our board of directors, we continued to turn back to the tuition pricing sensitivity analyses that Hanover completed to support the research behind our decisions. Once formally launching the 9 percent tuition reduction, the institution anticipates enrollment will continue to increase, specifically with respect to non-traditional student populations.